Attention my garden peeps: I need a favor. The National Garden Bureau is offering a grant to horticultural therapy programs that submitted videos. They have narrowed it down to three options and want folks to vote for the video they like best. The folks running the horticultural therapy program at the NC Botanical Garden submitted one for the work they do with The Farm at Penny Lane. It is a great program that is chronically under-funded. I just went to the NGB site and voted for them, and when the results page came up, they are way behind compared to the other two programs. This is the only finalist from the southeast region, and I would appreciate it if you folks would go visit the link and vote for The Farm at Penny Lane. We ate one of our last home-grown onions of the season last night. It was a Candy onion — a softball-sized, sweet mild white onion known for its good storage quality. After curing our harvested onions in our garage for a few weeks, we stored them in our cool basement. The handful of remaining bulbs down there have mostly now gone soft and will be composted. But all in all, it was without a doubt our best onion season ever. How did we do it? I think it was a combination of nearly perfect onion-growing weather and the application of a new strategy to combat a lesson learned the hard way. 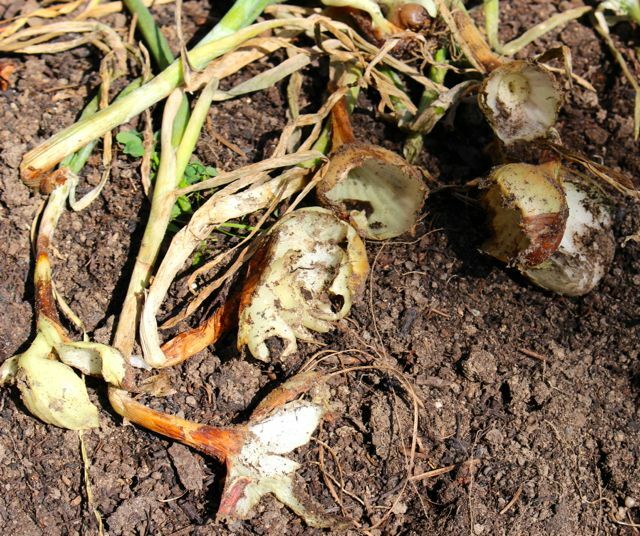 In the 2015 growing season, voles ate about two-thirds of our Yellow Granex onion crop. Voles are everywhere in my vegetable garden. 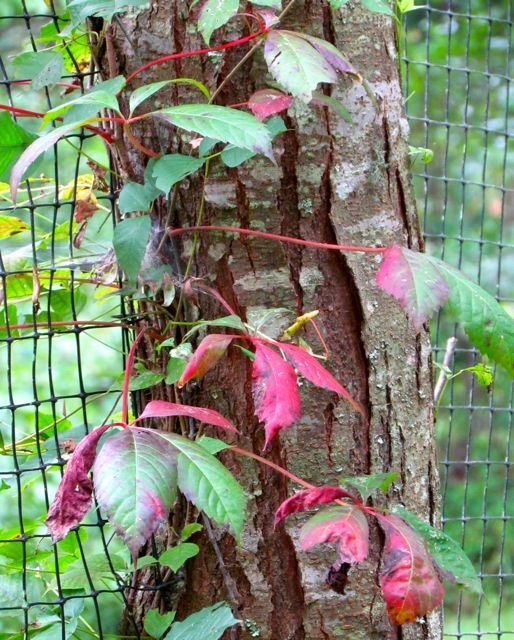 The sturdy deer fence that repels those hoofed beasts along with raccoons and even all but the most persistent squirrels merely protects the voles. 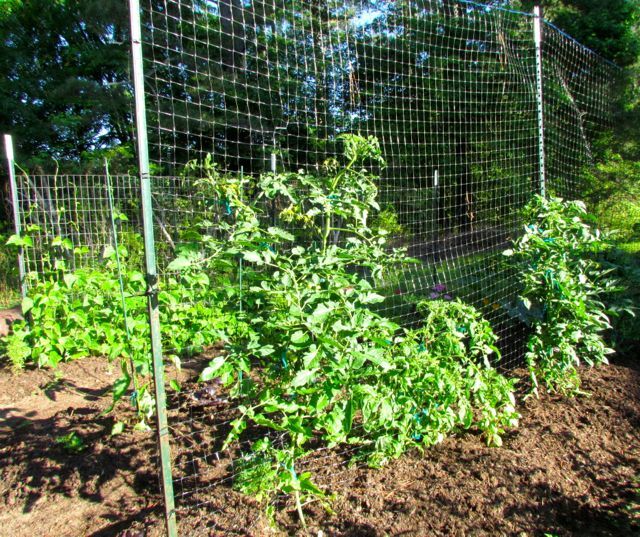 Dense plantings of vegetables provide ample cover for these voracious rodents when they venture above ground, so hawks and owls aren’t’ any better able to catch them than the wandering cats or coyotes thwarted by the fence. We’ve tried vole traps. I’ve reached the conclusion that the voles are amused by the contraptions. They build tunnels around them, and yes sometimes I’m certain I hear snickering down the ubiquitous holes I find in every vegetable bed. But this past spring, I tried a new strategy that I think is likely responsible for the abundance of beautiful bulbs we harvested, all with no evidence of rodent nibbling. The latest weapon in my vole-fighting arsenal. Swedish growers developed the above product; the name translates as “plant-protection.” It is essentially super-concentrated blood meal combined with a vegetable oil that ensures the product sticks to the plants upon which it is applied. The Swedes developed it to protect tender trees from gnawing critters during their long, snowy winters. It is USDA approved for organic gardening operations. But I suspected that if I merely sprinkled the product above ground around the onions, the voles would tunnel in and devour the bulbs again. So I went underground, where they operate. Onion plants freshly planted in their bed on Feb. 22, 2016. 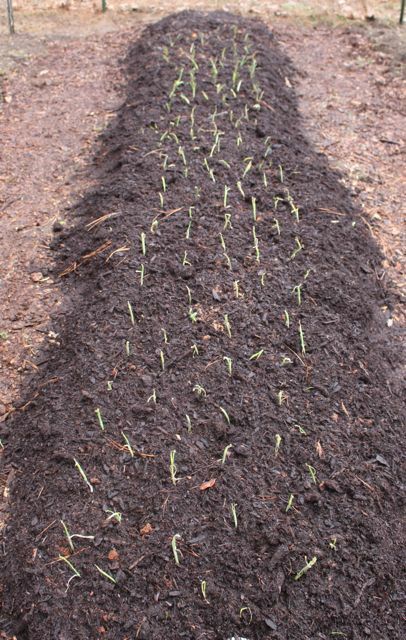 I took the above photo just after I finished planting the onion starts in their bed full of compost and supplemented with an organic root crop fertilizer. Onions like two things: plenty of nutrients, and a steady supply of water. Mine got both this year. I always order onion plants, because in my part of North Carolina, the plants need to be in the ground as early in the spring growing season as you can manage. 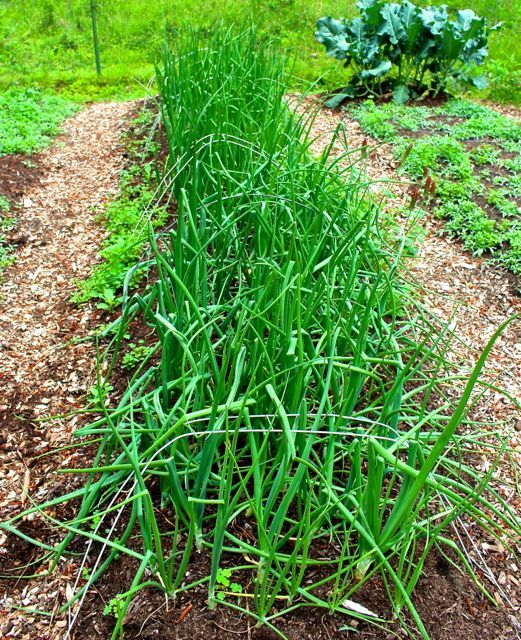 Companies that sell onion starts, as these skinny baby plants are called, contract with growers in the deep south, where their climate allows them to get seedlings going in late winter. The starts are shipped to customers when the growing season for onions is about to begin for a given area. My starts showed up on Feb. 20, and I was able to plant them on Feb. 22. They don’t look like much when you first plant them. February in my area was mild and relatively dry this year. I was thus able to clear and prepare my spring vegetable beds much earlier than usual. 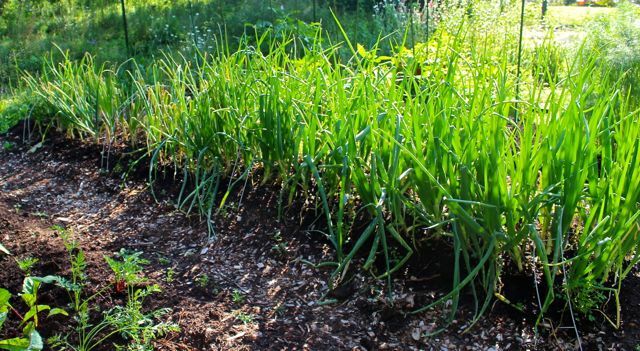 I cleared the onion bed first, because I knew I would need it first, so it was ready to go when my starts arrived, except for the implementation of my new anti-vole strategy. I decided to dig a trench outside the entire perimeter of the bed — about 6-8 inches deep — the level where I usually encounter the vole subway system. Inside the trench, I liberally sprinkled Plantskydd. The strong odor of dried (bovine) blood is supposed to repel rodents — and even deer. My results indicate that this is true. It would be interesting to conduct an experiment that compared this product to the less expensive blood meal product you can buy from organic suppliers. I didn’t, because I didn’t want to take a chance on losing some of my crop. 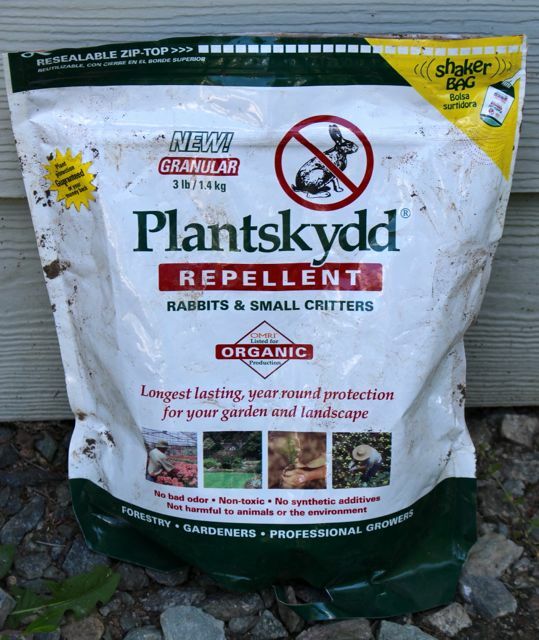 My suspicion is that Plantskydd is superior because it is super-concentrated, and because the vegetable oil mixed with it allows the dried blood to persist longer in the soil than regular blood meal. All I know for certain is that when we harvested our onions, we did not find a single vole tunnel in that bed. I am sold on the efficacy of Plantskydd. The onion bed on April 30, 2016. Yellow Granex Hybrid — These are short-day-length Vidalia-type onions; this is the go-to onion variety for my region. 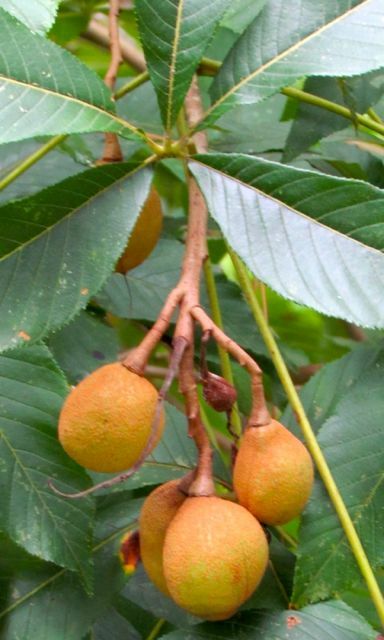 They are sweet, large and slightly flattened, with light yellow skin and flesh. They do not store well. Candy Hybrid — This intermediate-day-length onion was a bit of a gamble. Theoretically, it is less sensitive to the day-length issues that limit folks in my region to a few onion varieties. When I read they stored well, produced softball-sized bulbs, and were extra sweet with mild, white flesh, I decided they were worth the risk. The onion bed on April 30 with an adjacent bed of young salad greens behind it. Candy onions are on the left end; Yellow Granex plants are on the right end. Spring rains came fairly regularly this year, which hasn’t happened in quite a few seasons. 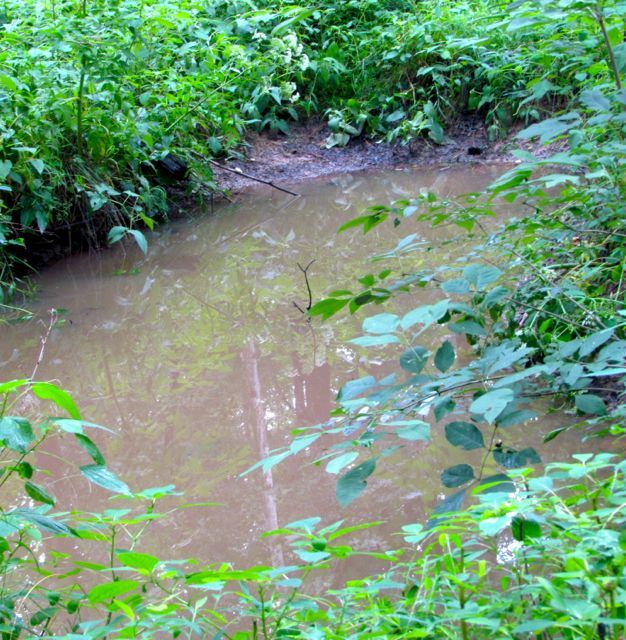 It had also rained enough during the winter to fill the shallow well that I use to water the vegetables; this has not often been the case in recent springs. 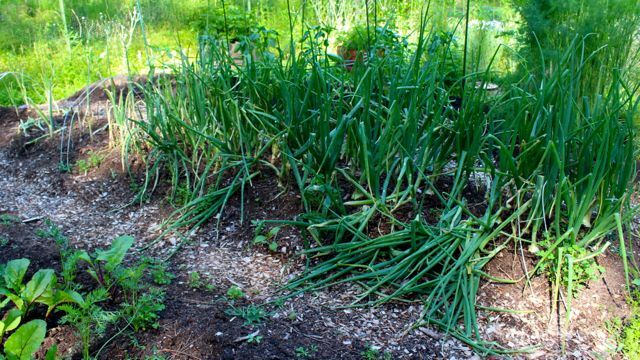 My onion bed received about an inch of water every week from late February through the end of May. I’m fairly certain this was the other reason our harvest was so successful. Onion bed just before first harvest on May 25. 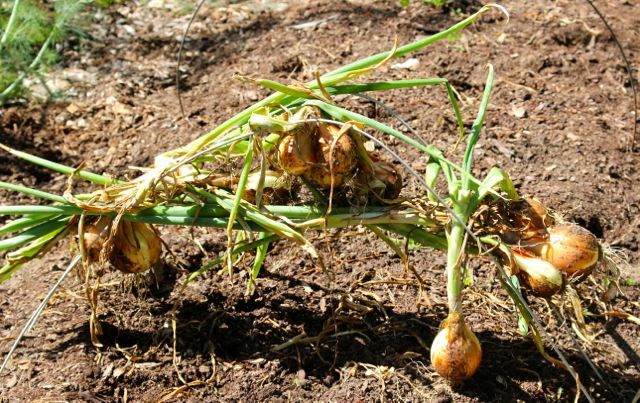 Onions are ready to harvest when the green stem at the base of the leaves where it attaches to the bulb flops over. The Yellow Granex plants (left end in the above photo) flopped over before the Candy plants surrendered to Summer’s impending arrival. We hung the harvested Yellow Granex bulbs — leaves still attached — to anything handy in the garage. 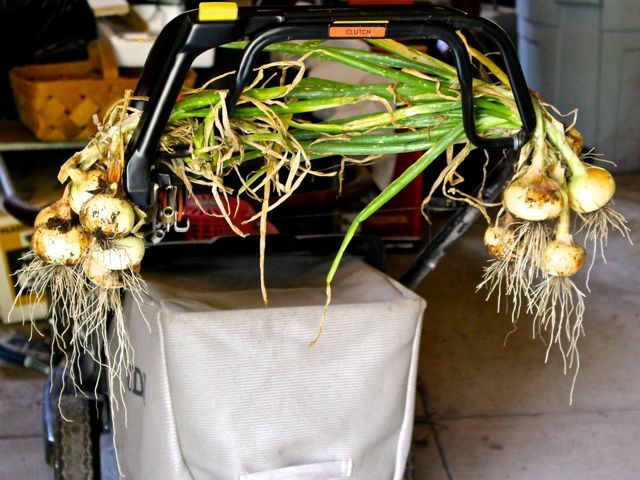 In this case, our push mower was drafted into onion-curing duty. The heat of early summer, perhaps combined with the disturbance created by harvesting the Yellow Granex end of the bed, seemed to push the Candy bulbs into accelerating their production cycle. By May 31, some of the Candy plants were flopping over, ready to be harvested. I kept watering as needed, trying to encourage the last of the Candy plants to push just a few more bits of goodness into the maturing bulbs. But by June 19, we had pulled up the last of this variety. The last of the Candy onion harvest on June 19. I pulled the onions in the early morning, then left them on their beds for an hour or so, allowing the skins to toughen up a bit before I moved them to the garage. We found that the Candy onions actually tasted sweeter after we let them rest in our cool basement for a month or so. In the meantime, we devoured the Yellow Granex bulbs, since we knew they wouldn’t store as well. One of Wonder Spouse’s favorite ways to cook our onions is to marinate them briefly with other summer veggies — such as squash, tomatoes, and fat portobello mushrooms — and then grill them just long enough to heat them up and give them a bit of yummy charred goodness. Whatever meat he added to the mix played a distant second fiddle to those sweetly zingy grilled onions. My mouth is watering from that tasty memory as I type this. I will definitely be employing my Plantskydd methodology for next spring’s onion crop. It will be interesting to see if I can repeat — or even better — my results. I used this product in a couple of other ways in my vegetable garden this year. I’ll tell you about those techniques soon, as I continue to review this year’s growing season. Young pepper transplants in front of maturing onions on May 25. 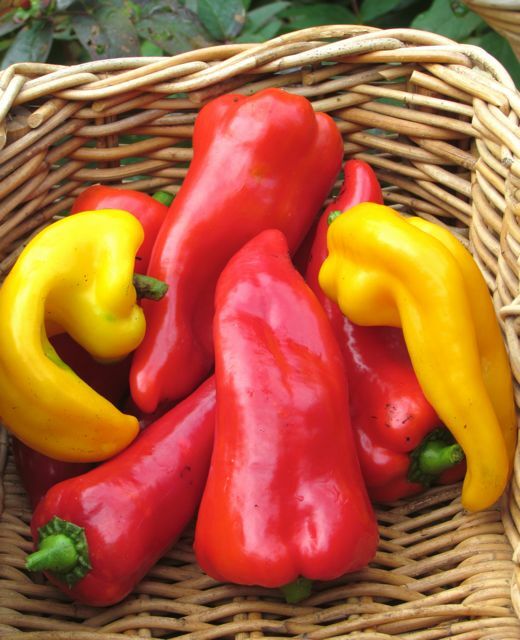 These peppers are still producing, thanks to an unusually prolonged, frost-free fall. 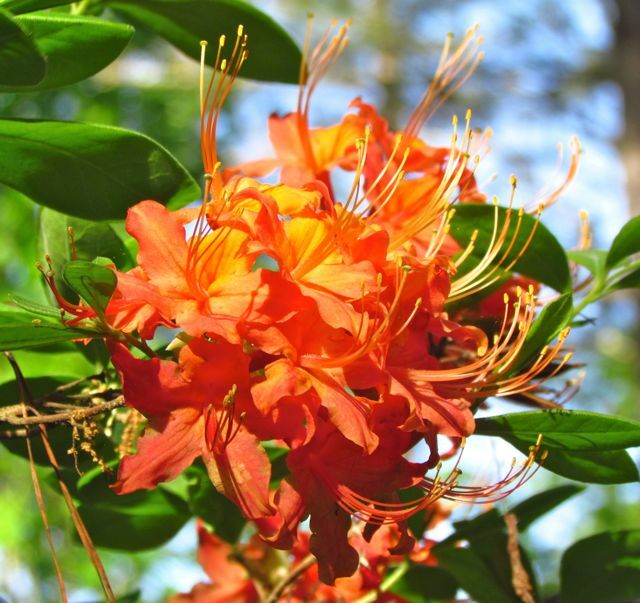 Native Rhododendron flammeum in full bloom. 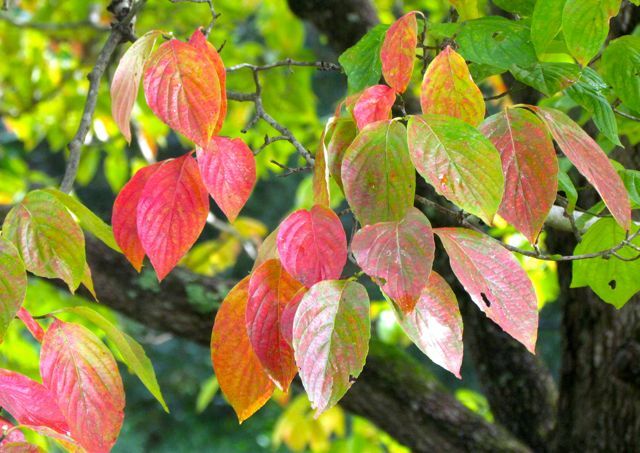 If you’ve lived in the southeastern piedmont region of the United States for long, you’ve probably heard the oft-repeated phrase, “fall is for planting.” And it is a guideline worth taking seriously. But every spring, many gardeners get itchy planting fingers. I know that after my vegetables and ornamental annuals are planted, my eye begins to spot those places in my landscape that would benefit from a new plant or two. 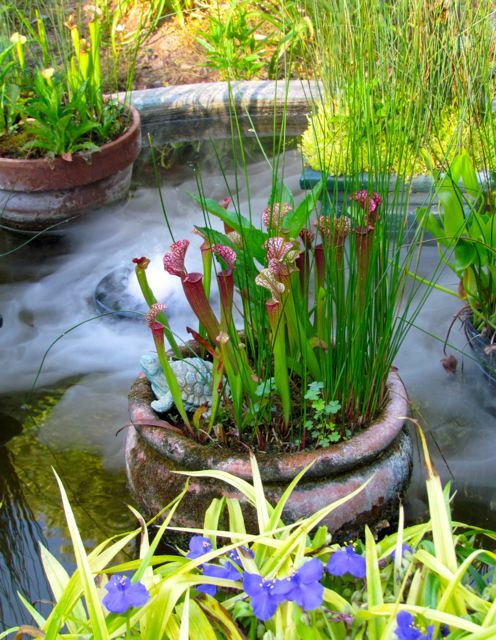 Or three – self-control is a challenge for me, I confess, when it comes to new plant acquisitions. 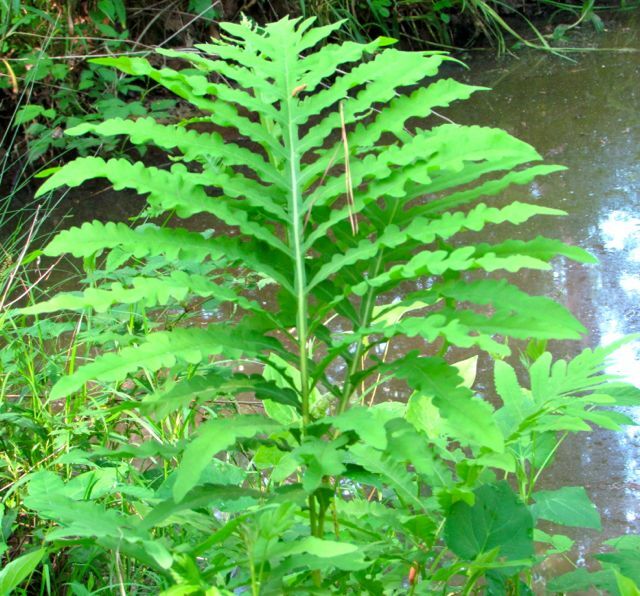 Sensitive Fern is so named for its sensitivity to frost. Give the new plants extra attention throughout the summer and fall. 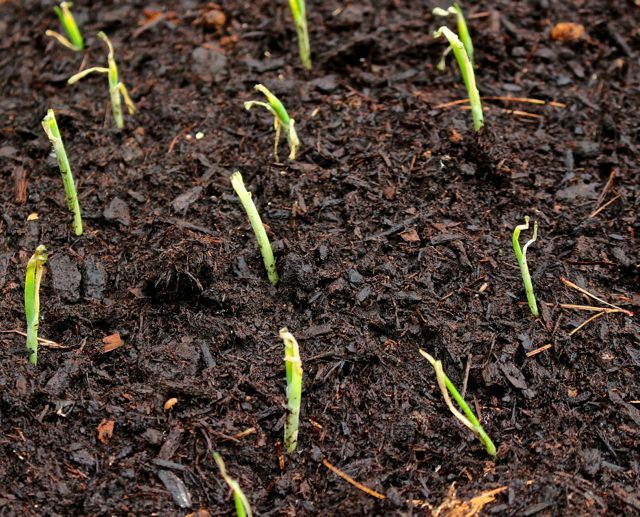 Of course, mulch them well, and if we go into a drought, these new plants will need extra water, because their root systems will not have had a chance to grow deeply before the heat hits. If we get an exceptionally prolonged heat wave, consider shading the new additions if they appear to be adversely impacted by the searing sun. 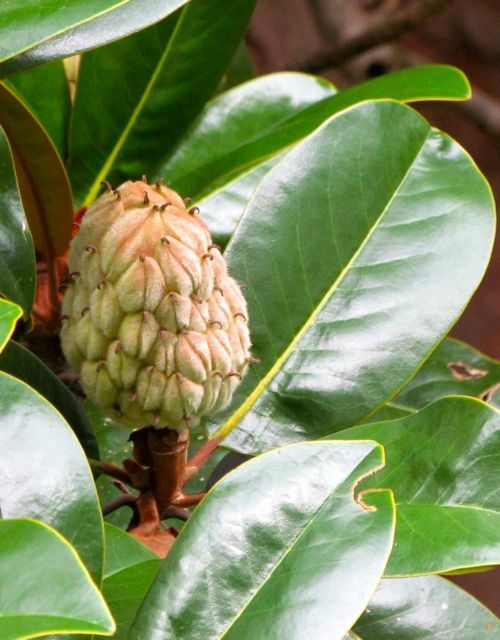 Add plants that are native to the southeastern United States. 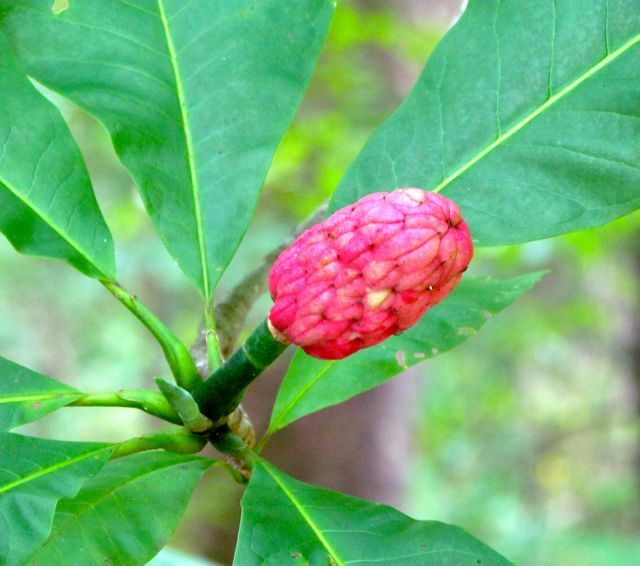 The reasons for planting natives are myriad. I’ve enumerated some in a previous post here. But from a purely practical perspective, native plants are best adapted to our growing conditions, so you can expect them to weather our summers better than non-native choices – as long as you site them correctly, of course. 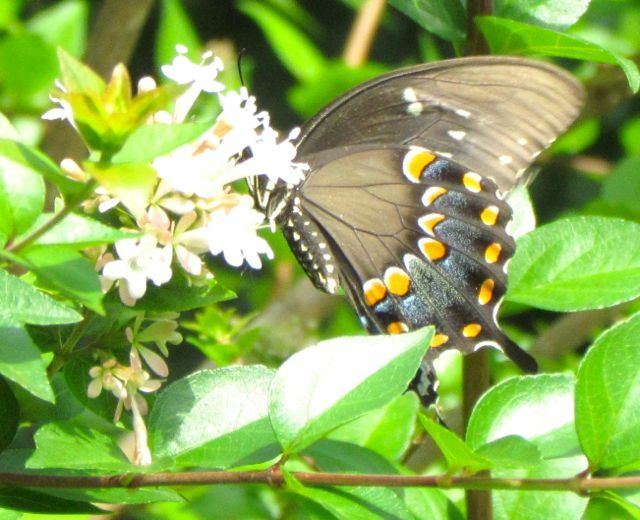 Swamp Milkweed is a food plant for Monarch caterpillars and a nectar source for many butterfly species, including this Spicebush Swallowtail. It’s not too late to even build a whole new bed or two. 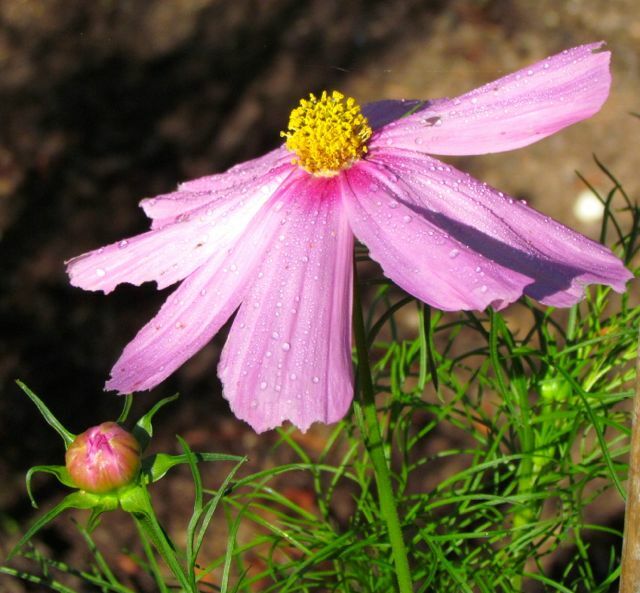 Do you have a sunny spot you could turn into a pollinator garden? How about a spot where all the water drains in your yard? 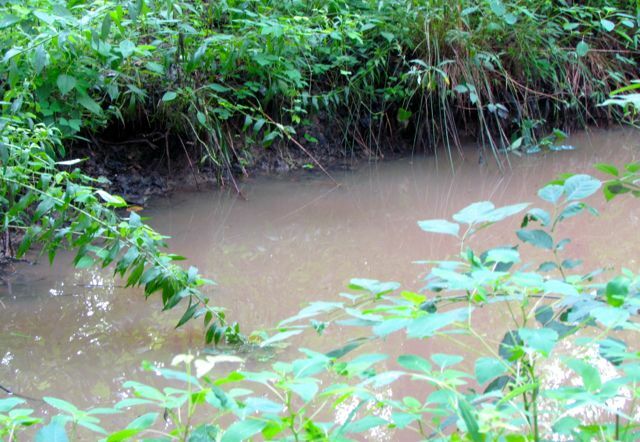 Such areas are ideal for rain gardens that can contain flowers, shrubs, and trees that benefit from extra water and can tolerate occasionally flooded root systems. Is your yard one big shade garden? There’s always room for a new fern or two, a new shade-loving wildflower, or one of the many great native shrubs that will provide four-season interest for you, and food and cover for native wildlife. My planting fingers are getting itchy just from typing that! These are all wonderful local growers, and I believe I am growing plants from all of them, except S&J, and that’s only because I just don’t grow that many carnivorous plants. These growers will be offering locally grown natives, and much of their stock comes from local sources. Yup, they often gather seeds and cuttings from natives growing in our region to ensure the plants will be best adapted to our local conditions. That is never the case at the big box stores. The Purple Milkweeds I recently acquired from Growing Wild Nursery are just starting to open for business. This event isn’t just for gardeners. Bring your spouses, your kids, and your grandkids. There will be live music, food trucks, tree-climbing and giant bubble making, a sale of gently used gardening books, a raffle, and eleven local conservation organizations will have tables staffed with volunteers who can answer your questions about their groups. So while we gardeners are fondling our native options, our families can be enjoying all these other activities. 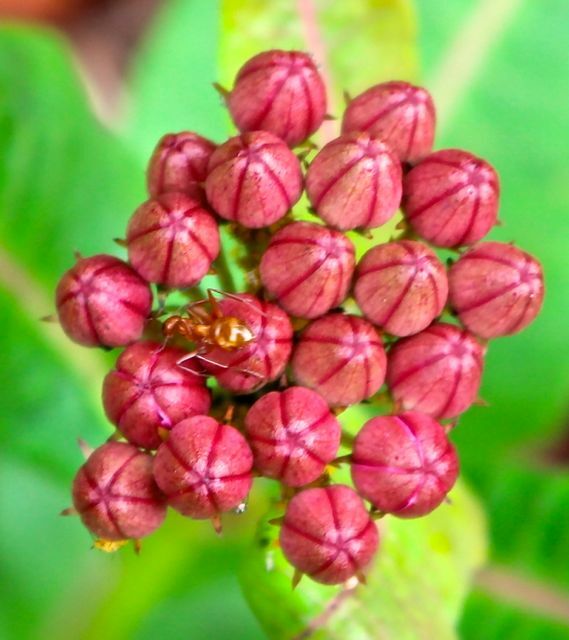 For the best selection of popular natives like this milkweed, come early. The event lasts until 8:00 p.m., but if you want the best selection of plants, I suggest you get there when the doors open at 4:00 p.m. You can grab what you want, then enjoy the music and food, and mingle with your fellow native plant lovers. Matt Gocke, Greenhouse and Nursery Manager extraordinaire at the NCBG, was kind enough to share with me the list of goodies he’ll be offering for sale from his greenhouse at this event. Here are a few highlights. 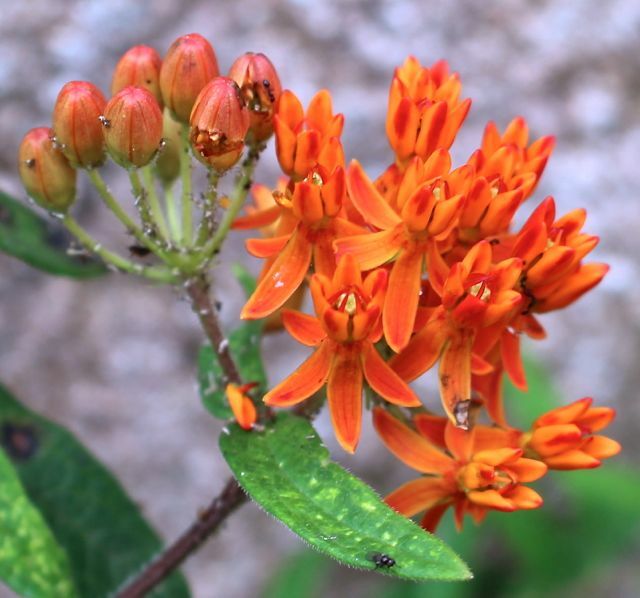 If you want to begin or add to your milkweed collection for your Monarch butterfly habitat garden, he’ll have five different species for sale: Clasping Milkweed, Swamp Milkweed, Longleaf Milkweed, Common Milkweed, and Butterfly Milkweed. Growing conditions vary for these species, so you should be able to find at least one that will do well in your landscape. 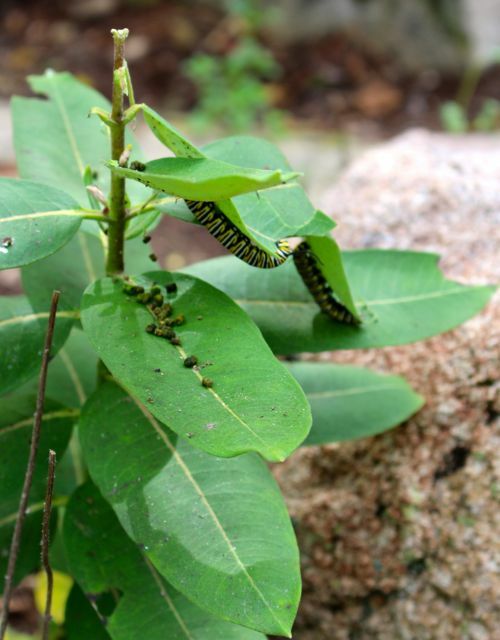 Monarch caterpillars dining on Common Milkweed. He’ll be offering several interesting native vines, including Climbing Carolina Aster (Ampleaster carolinanus), Potato Bean (Apios americana), Leather flower (Clematis viorna), Large-leaved Dutchman’s Pipevine (Isotrema macrophylla), and Purple Passionflower (Passiflora incarnata). He’ll have a really nice selection of native ferns, grasses, and sedges, gazillions of great native wildflower options, and some choice native shrubs and small trees ideally suited for tucking into empty spots around your yard. 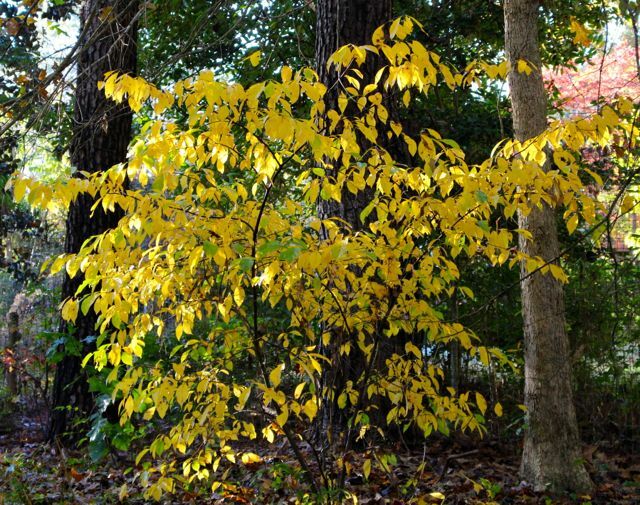 The main food source of Spicebush Swallowtail caterpillars, native Spicebushes provide gorgeous fall color for shady spots in your landscape. So, my fellow native plant gardening enthusiasts, spend some time this week pondering your home landscape. Now that everything has leafed out, it will be easier to spot any gaps where a native azalea might dazzle the eye, or a bed of ferns might soften a shady spot. Then tell your families about the great event you’ll all be going to on May 21. Food, music, and plants – it doesn’t get much better than that. Last week was too hot here, the heat made worse by the fact that most of the summer was unusually mild. Dust clouds rose with the slightest disturbance, lingering long in humid, stagnant air. It was not a week conducive to gardening. Finally this past Sunday, cooler weather began to creep in, accompanied by clouds that dimmed what had been searing sun. Wonder Spouse immediately charged outdoors to catch up on tasks delayed by the heat, leaving our garage door open as he moved back and forth fetching tools, wheelbarrows, and assorted other necessities. His tasks did not require a second pair of hands, so I grabbed my camera and began acquainting myself with the latest developments on our five-acre jungle. Fruits of Halesia diptera will turn light brown when they’re fully ripe. Fruit — that was the takeaway message from this walk. Most plants are well into fruit/seed production, clearly aware of dwindling daylight and down-trending temperatures. The Solomon’s Plumes I added to a wildflower bed on the north side of my yard all made numerous berries this year, as you can see in the photo above. 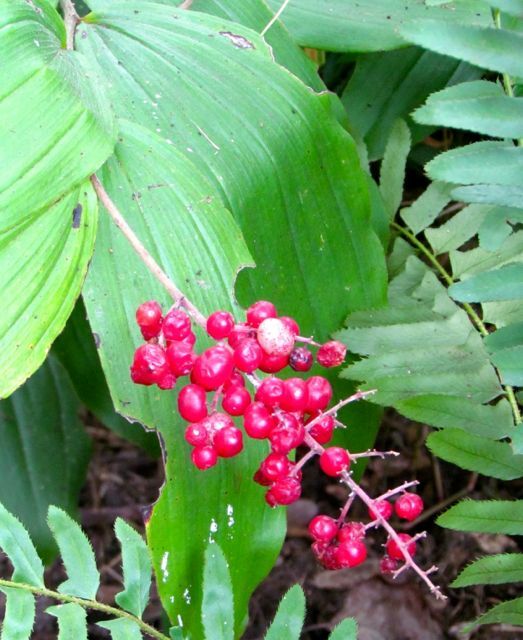 The empty stems you see likely tell the tale of a hungry bird or other critter sampling these bright red berries. I think they look especially festive mingling with the evergreen Christmas fern — another native to our region. 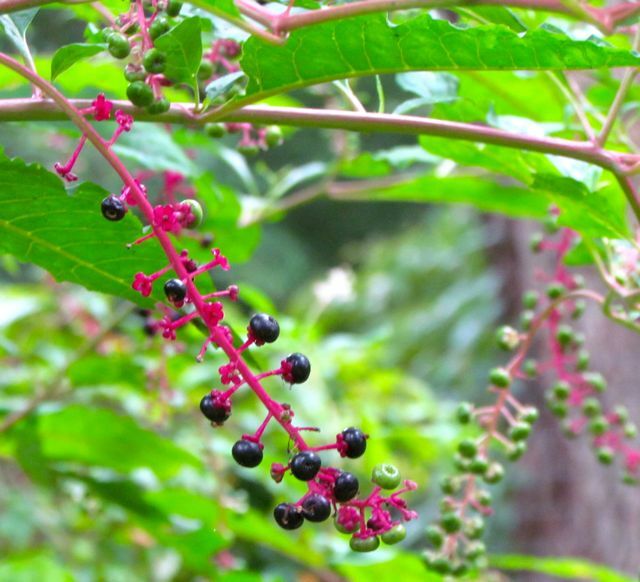 Giant magenta stalks of Pokeweed — easily 8 feet tall — bend from the weight of purple-black clusters of ripe berries. These are favorites with many of the avian inhabitants of my yard, as evidenced by purple-tinged splats of bird excrement deposited on my walks and decks. Branches of the large Red Buckeye on our floodplain are touching the ground, bent from the weight of nearly ripe fruits. 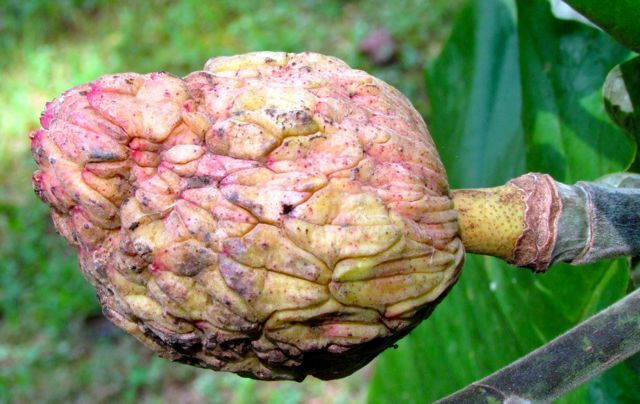 Soon the husks will split and the shiny nut-like fruits will tumble to the ground. 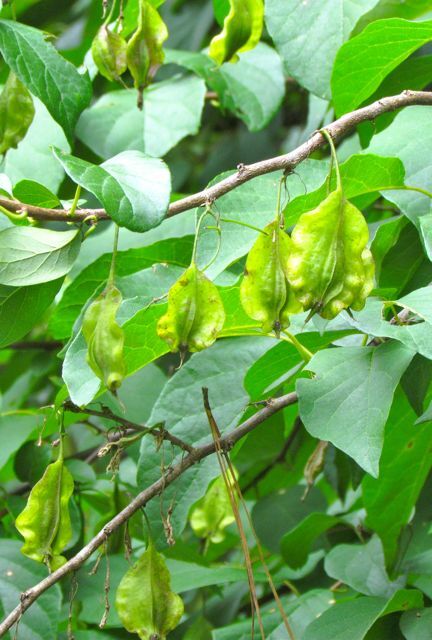 These nuts are poisonous to people, but some wild inhabitant makes them disappear every year. The greatest surprise during my walkabout was my Hammocksweet Azalea — in full, overpoweringly fragrant bloom at the base of my north-facing garden, close to the creek. I sited it there, because this deciduous azalea — the last to bloom for me every year — is native to wetland environments. The flowers are pure white, without a hint of ivory, and their fragrance is knock-your-socks-off sweet. If it were any closer to my house, I think the fragrance might be overpowering, especially as this shrub continues to grow. 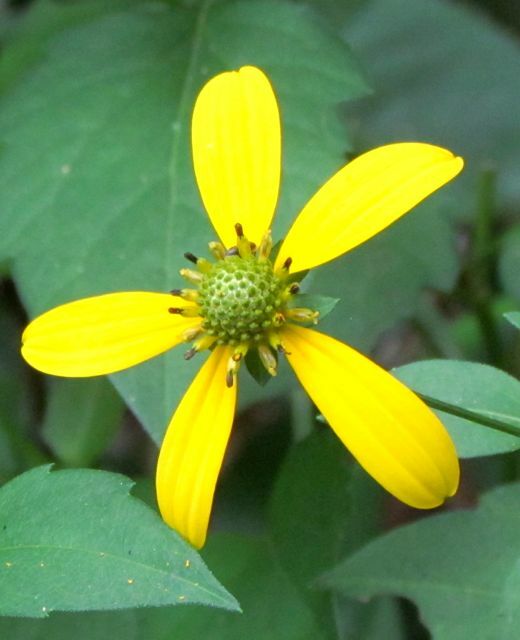 September is the month that many large native yellow composite wildflowers adorn every corner of my yard, and many roadsides. I added Green-Head Coneflower to the mix, because I love the prominent seed heads it forms, as do the seed-eating birds that dwell nearby. My vegetable garden is mostly done for the year. A few peppers linger, and some broccoli plants are struggling to grow beneath the shelter of their Reemay tent. Many of the beds are packed with fresh green sprouts of crimson clover, my winter cover crop of choice. 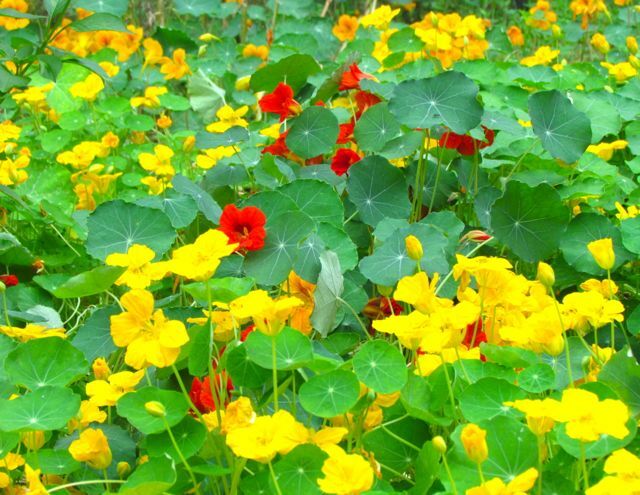 But one bed is dominated by the lovely mix of nasturtiums above. Unimpressed by heat, drought, deluges, or anything else as far as I can tell, they bloom continuously, spreading wandering shoots in all directions, even mingling a bit with adjacent beds full of crimson clover. Their gentle rose-like scent is nothing short of heavenly. I encountered a bit of wildlife as I made my way around my yard. I think perhaps they’d been hunkering down during the heat wave too. Like me, they were out and about in force during my morning walk. Bird song filled the air. Many toads greeted me in all parts of the yard. I’m always happy to see these insect-eaters. A Green Anole rushed out of a potted plant when I began watering it. It was bright green to blend with the vegetation, and if it hadn’t objected to being watered, I likely would have never noticed it. Five-lined skinks skittered across open ground and up and down trees. 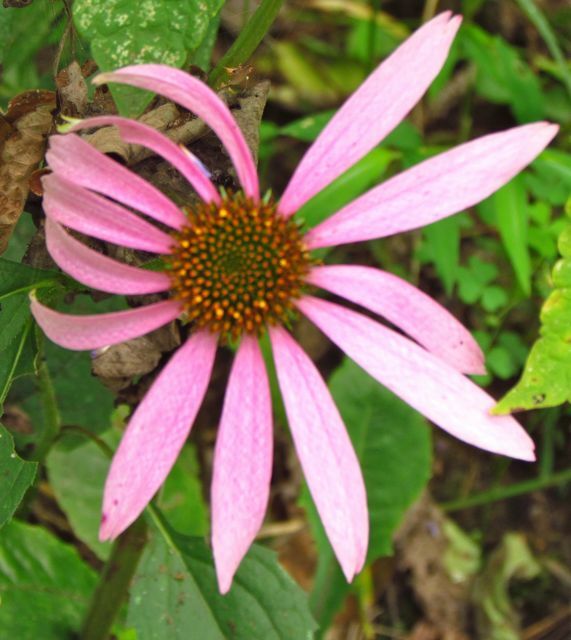 A Black Racer darted beneath an aster blooming by my front deck when I got too close; it had been trying to warm itself in the cloud-dimmed sun. But the highlight of the day came after I had put up my camera and gone back outside to gather some tools in the garage. A frantic bird fluttered at the back windows, too confused to realize that its way out was the other way, through the open garage door. It was an Eastern Phoebe, a small flycatcher common to my yard, thanks to the woodland creek — its preferred habitat — that borders our land. I have spent many happy hours watching this beauty hunt from my back deck. Its keen eyes watch for flying insects. When it spots one, it leaps into the air, grabbing the bug on the wing, then returning to its perch to watch for more tidbits. Its aerial acrobatics are impressive, and its squeaky call, sounding more like a child’s squeeze doll than a bird, let’s me know it’s on bug patrol. So when I discovered this distraught Eastern Phoebe desperately trying to escape our garage, I leapt into action. First, I opened all the other doors. Often this is enough to help a trapped bird find its way out. But this little one was unwilling to venture from the high window at the back of the garage. I next tried using a light-weight rake to reach up toward the bird, in the hopes that it would hop on and let me carry it out. This works surprisingly well with the occasional discombobulated hummingbird. But not so for this Eastern Phoebe. Instead, it fluttered down the back wall, settling on a piece of plywood leaning against the wall, and mostly hidden by another, taller piece of plywood. I did the only thing I could think of. I quietly asked the little bird if it would allow me to pick it up with my hand and carry it to safety. It didn’t move, probably exhausted from its fruitless escape efforts. I chose to interpret its stillness as permission, gently reaching behind the plywood. The poor, exhausted creature didn’t even struggle in my gentle grasp. I quietly thanked it for its cooperation as I carried it toward the front of the garage. I could feel its heartbeat thrumming through my fingers, otherwise feeling no movement. But as soon as we were clear of the garage, the soft brown bug hunter in my hand began to push against my grasp. I opened my palm and it immediately flew high into a nearby tree, apparently none the worse for its misadventure. I closed all the garage doors to prevent further accidents, still feeling the heartbeat of that beautiful wild creature in my hand. Not for the first time, it occurred to me how blessed I am to live among the wild ones on our five acres of green chaos. So many people live their entire lives without ever feeling what it’s like to hold a bird in the hand. 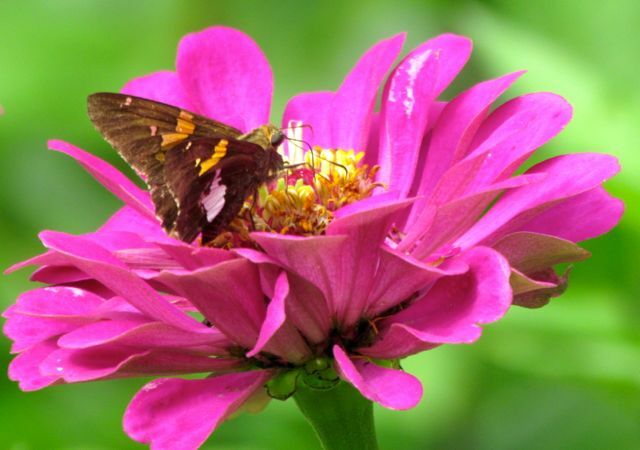 One of the suddenly abundant Silver-spotted Skippers enjoys a refreshed zinnia. Two months to the day after the last drenching, inch+ rain event on my yard, the rains finally returned. My rain gauge registered almost exactly a two-inch total for the event. Of course, the airport a mere 30 miles away measured over twice that, but I’m willing to overlook that this time. The only puddle that remained by this morning was in the driveway, and its size was modest compared to previous puddles. When I walked the floodplain this morning, the ground was not muddy anywhere, but it was at least not dusty anymore. And the grass grew half a foot overnight, of course. Even though the rains came down hard for much of the event, little managed to run off into our creek. I know this, because the creek water level is still quite low. The water is muddy, but barely flowing — still an improvement over the thin thread that occupied that space a few days ago. The little pond I showed you in my previous post is not full to the top, but the level did rise. Compare the following two photos to those in the previous post. The pond level rose, but not to the top. Last weekend, Wonder Spouse decided to harvest his remaining two potato bags. The heat and drought were making the plants look pretty sad, and he was worried the tubers below might be adversely impacted if he waited any longer. I showed you the harvest of Viking Purple potatoes in the previous post. All three varieties Wonder Spouse grew this year began as a pound apiece of seed potatoes. From that, his yield was 6.3 pounds of Viking Reds. 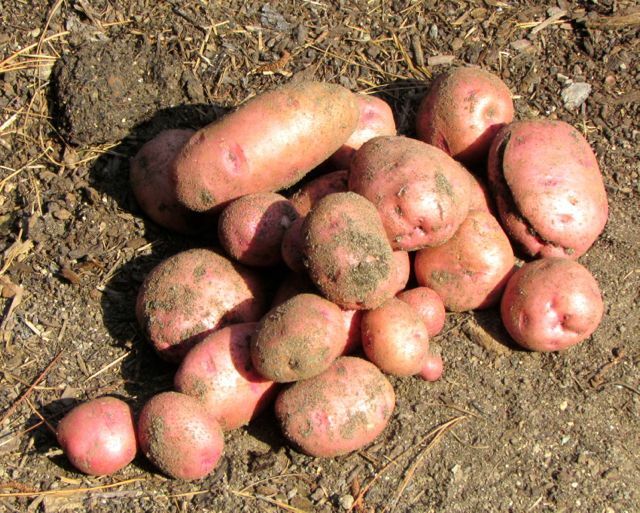 The new variety he tried this year, Marris Piper, yielded 7.3 pounds of smaller potatoes. Marris Piper yield with a pine cone for scale. 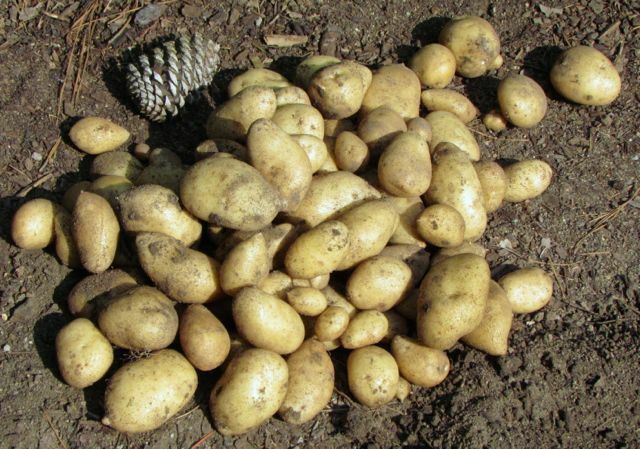 Potatoes are never tastier than when they are freshly harvested, and we have been enjoying frequent potato feasts. Any way you prepare them, the flavor is astonishing if you’ve never eaten anything but old tubers from the grocery store bins. The other vegetables remain productive despite the drought. In fact, I suspect that the drought is the reason they are still doing so well. During last year’s highly unusual rainy, cool summer, the beans, tomatoes, and squashes all succumbed to fungal diseases quite early in the summer. This year, I’m still picking lovely zucchinis. Two of the six plants have surrendered to the evil squash vine borers, but the other four are still valiantly producing, aided, I suspect, by numerous enthusiastic honeybees from my neighbor’s hive. Thanks, neighbor! 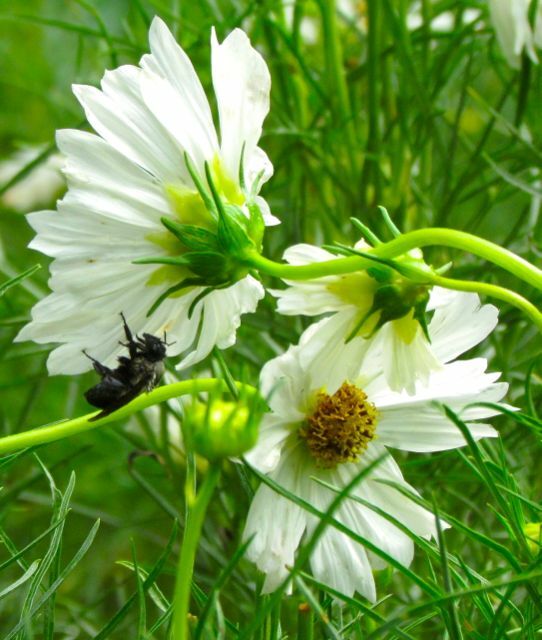 A soggy carpenter bee dries out beneath a cosmos flower, where it likely sought shelter from yesterday’s rains. Speaking of pollinators, the almost completely absent butterfly population is finally showing signs of returning, no doubt aided by recent rains. 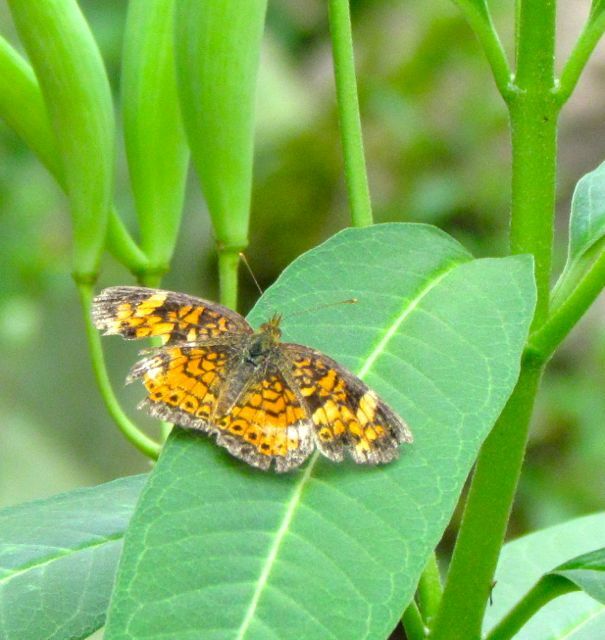 The local experts on the lepidoptera (butterflies and moths) chatlist are theorizing that the previous unusually cold and sometimes wet winter killed most of the overwintering larval stage of these insects. We’re finally beginning to see some, probably migrants from areas that weren’t so adversely impacted. So far in my yard, I’m still seeing almost no swallowtails, but the little skippers and other small butterflies are now showing up in the numbers I expect, especially now that the flowers have been fortified by adequate (for now) rain. A battered Pearl Crescent rests on a milkweed leaf. I’ve seen no Monarchs this year, alas. I did spot the first bright green Praying Mantis of the summer a few days ago. It was loitering in a marigold growing next to my beans. I usually don’t notice these predators until about this time of year, as they grow larger in preparation for egg laying. 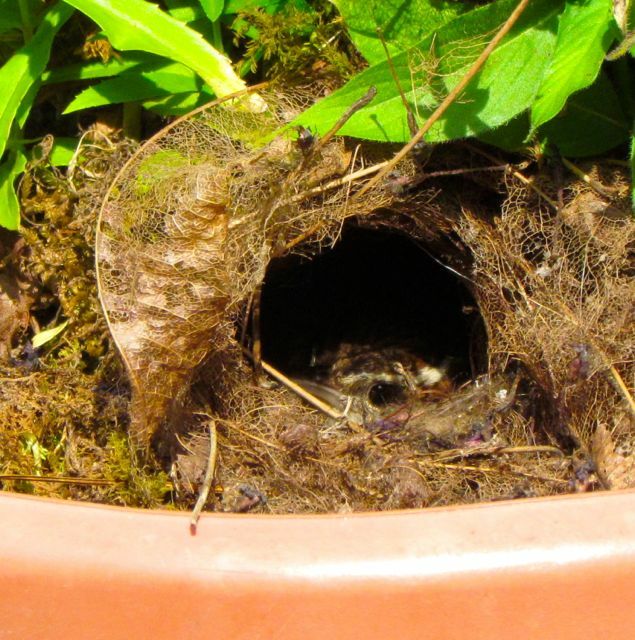 Speaking of egg-laying, just before the rains hit yesterday afternoon, I noticed the Carolina Wrens nesting in a pot on my back deck were covertly flying back and forth — a sign that at least one of the four speckled eggs they’d been tending had hatched. I tried to get a peek this morning, but only managed to annoy a damp Mrs. Wren snuggled inside the nest. That’s her unblinking eye staring at me. A bonus with the rain is an influx of below-normal cooler and drier air, which is predicted to linger for several days. For me, that means I’m out of excuses regarding weeding and other plant-maintenance tasks. But with moistened ground and a refreshing air mass, digging in the dirt will be a pleasure, not a hardship. The rains are predicted to return in a few days. Perhaps now that my yard has been re-moistened, some of the future juicy clouds will choose to visit soon. Here’s hoping all our gardens receive the rain they need to flourish. My apologies, gardening friends, for my lengthy silence here. I am still recovering from the worst illness I’ve battled in decades — a horrible sinus infection brought on by traveling to a city with an inhospitable climate: Phoenix, Arizona. I realize many folks love it there, but I’m a creature of humid Eastern US forests. According to a good friend, that was my problem. She tells me I have “East Coast sinuses.” Even my doctor has encouraged me to avoid traveling back to the arid southwestern US as much as I possibly can. By the time Wonder Spouse and I were flying home, I could feel the uninvited bacteria burrowing deeply into my sinus cavities. I was sipping my giant cup of iced tea from the airport Starbucks and daydreaming about my garden when one of the flight attendants interrupted my reverie. She asked if she could have the large plastic cup holding my iced tea when I was done with it. She told me she was a gardener, and she used the plastic cups to protect her young vegetable seedlings. 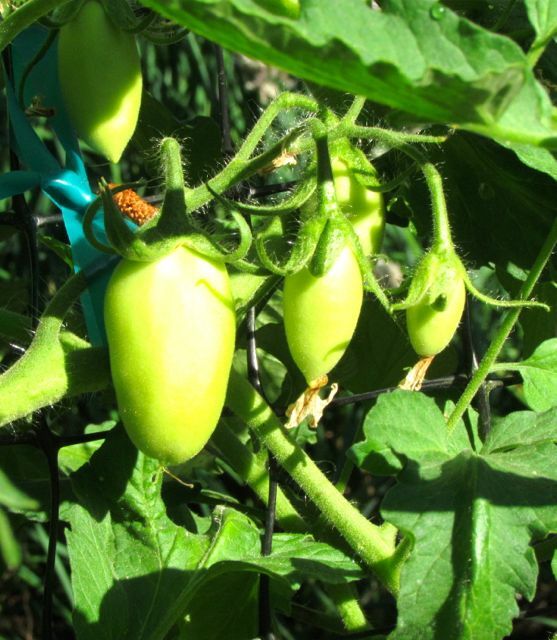 Paste tomatoes on May 24. Photo by Wonder Spouse using my camera. Never has a flight attendant ever asked me for anything beyond a beverage order. In the most unlikely of locations, I’d found a kindred spirit — a gardener! Of course, I told her that I’d be happy to hand over my cup to her, and I shared the fact that I also gardened. Immediately, her face brightened. She smiled broadly, told me her name was Savannah, and thanked me. A half hour or so later after all the passengers had been served their beverages, Savannah surprised me by returning to my seat with her IPad in hand to show me pictures of her garden. I was duly impressed. As I told her, she does not have green thumbs; Savannah has green hands! May 24 — Our tomatoes and other veggies. Savannah is originally from a Caribbean country; her voice carries the slightest hint of her homeland. Now she gardens in Albuquerque, New Mexico on two acres. She has a Wonder Spouse partner too, and from the pictures she showed me, they have worked wonders in that arid region. She uses the plastic cups like the one I gave her after she cuts out the bottoms. They protect young plants from often harsh winds, and also the voracious rabbits that are her great animal pest challenge. I was tempted for a moment to think Savannah had it easier than me — only rabbits? No deer, groundhogs, voles, squirrels, and in my case, occasional marauding beavers? But her photos revealed why the rabbits plague her garden. It was the only green spot in the photos. 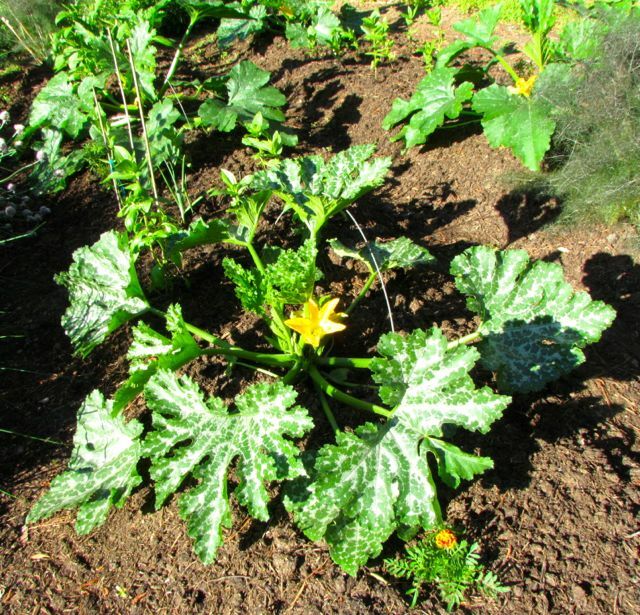 May 24 — As is their habit, the zucchinis grew enthusiastically during our absence. Savannah waters her garden from a well dedicated for that purpose. Without that water, she would have no garden. But add water and her green hands, and wow! She showed me an array of happy vegetables, some lush Caribbean herbs sent by her mother that are essential ingredients to her homeland’s cuisine, and an orchard planted in the shape of a peace symbol. Her hubby wanted it to be visible in aerial photos — and it is! She showed me a GoogleEarth shot to prove it. By this time, I was thoroughly convinced that Savannah had some of the greenest hands of any gardener I’d ever encountered. And then she showed me her orchids. Breathtakingly gorgeous plants — dozens of them — all blooming as if they’d just been taken from a speciality greenhouse. But Savannah doesn’t have a greenhouse. Her exquisite orchids obediently bloom as house plants for her. I was flabbergasted! 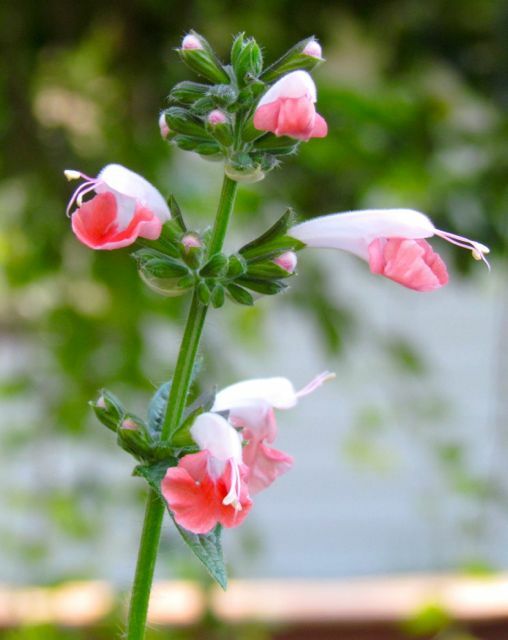 Salvia “Coral Nymph” on May 24. Savannah fights an arid, hot, windy climate to create her lush landscape, but that harsh environment does make one aspect easier for her than me. She has no weeds — not because she is an attentive weeder, but because that climate doesn’t support anything remotely resembling the weed jungle that I battle constantly. I was envious — for about 2 seconds. Then my sinuses reminded me why I’m not a fan of arid climates. Wonder Spouse has been a trooper while I’ve been stuck indoors single-handedly (or is that nosedly?) ensuring the success of the tissue industry. He’s been out tying tomatoes and taking pictures, even rising early to harvest produce before morning temperatures grow too hot. He took all the pictures in this post for me on May 24. The garden has really taken off since these photos. I’ll show you more soon. I intend to write several catch-up posts to try to make up for my prolonged silence. But this first one had to be about Savannah — the green-handed gardening flight attendant who fiercely nurtures her charges in a hostile environment. It was a delight to meet such an avid gardener in such an unexpected location. Thanks for sharing, Savannah. This last picture is for you — my front water garden showing off some North Carolina natives that, like me, would never make it in your climate — even under the care of your amazing green hands. May 24 — Our water garden flourishes. 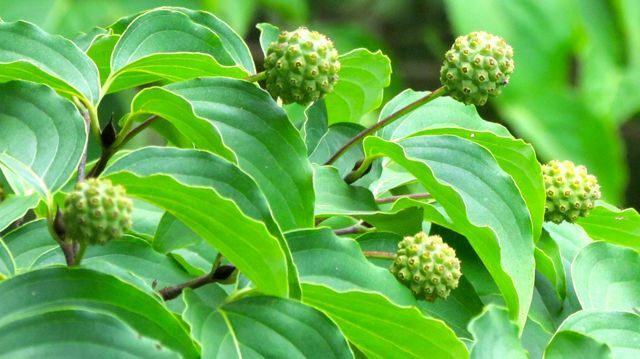 Cornus kousa fruits will redden soon. Halesia diptera fruits dangle from every branch. Raucous cries of Pileated Woodpeckers echo through the forest as they argue with greedy robins and complain about magnolia cones ripening too slowly. A few mornings ago just after sunrise, three of these crow-sized woodpeckers called and flew in circles over my head for a minute or so. Two were chasing a third, making it clear that the interloper was not welcome. And today, as Wonder Spouse and I walked beside the creek, we startled Wild Turkeys on the other side. They squawked once, then ran silently to the blackberry thicket, where they disappeared amid its prickly greenness. Our wonderfully wet, mild summer made our two Franklin Trees very happy. Both grew several feet higher, and the mature specimen produced more flower buds than I have ever seen before. Spent snowy blossoms littered the ground beneath it, still faintly emitting their gentle rose-like scent. I held down the branch, so that Wonder Spouse could take the shot. You can see its close kinship to camellias by the form of its breath-taking bloom. The leaves of our smaller tree are already sporting garnet hues. 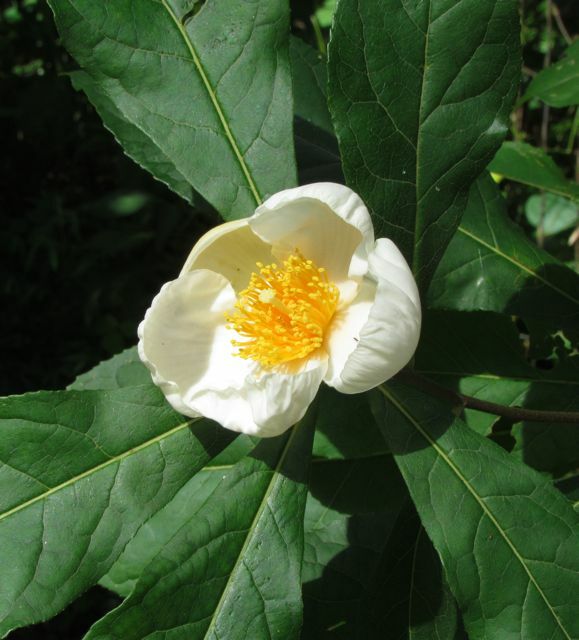 But the flower-producing tree remains green-leaved. 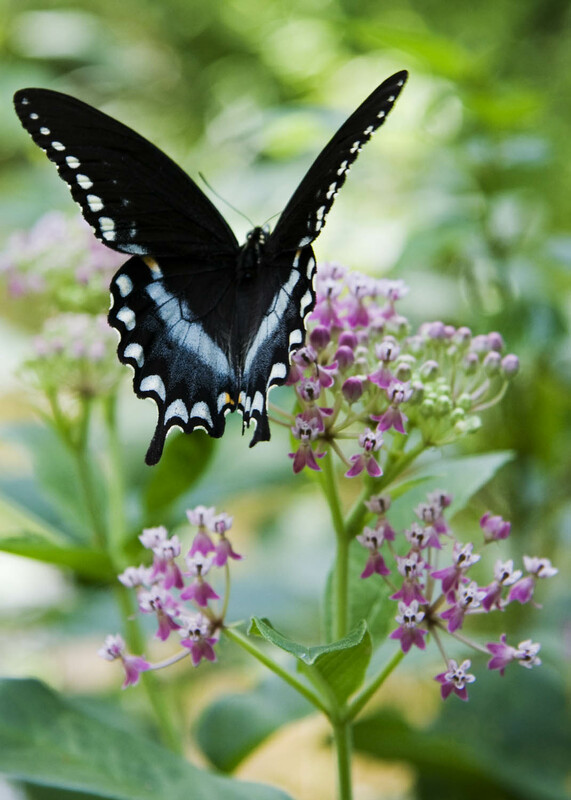 Every time I think the record numbers of swallowtail butterflies are waning, another wave of fresh-winged beauties descends on every bloom in the yard. The Chinese Abelia still plays host to dozens, even though its sweet white flower clusters are beginning to diminish, but that’s OK, because the Seven-Son Flower Tree is in full, fragrant bloom, attracting every pollinator in the neighborhood, from butterflies to bumblebees, mason bees, and hawk moths. I cannot use my front walk without getting bumped into by a floating winged beauty. 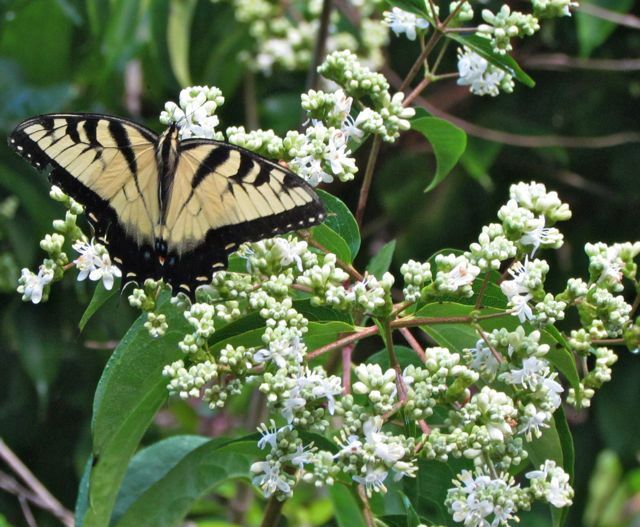 An Eastern Tiger Swallowtail enjoys the Seven Sons Flower Tree. The abundance of butterflies has been a bonanza for predators as well. Myriad dragonflies pick off the lazy flutterers in mid-air, scattering severed wings of gold and black along the walk. And the most certain early sign of autumn abounds: spider webs. As fast as I knock one down walking anywhere in my yard, the industrious weavers rebuild. A particularly clever female Writing Spider has declared her domain over the water feature in our front garden. 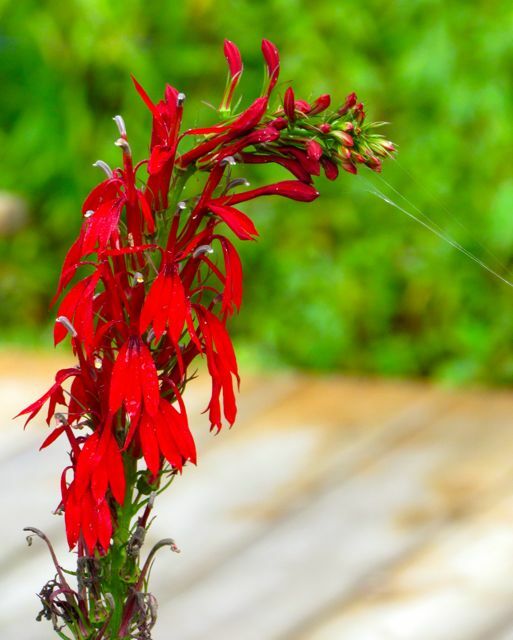 The abundant blooming spires of Cardinal Flowers are irresistible to butterflies, and this fattening weaver is taking full advantage of that fact, even bending the top of one spire to anchor her web. The direction of the bend points to the fat weaver’s sticky trap. Yesterday, I saw her trap and devour at least two large butterflies. Today, she seems to have doubled in size. Female Writing Spider awaits her next victim. Perhaps in response to her rapid growth, today a male Writing Spider has built a modest web adjacent to this queen, even using a corner of her web as an anchor. Much smaller than the female he lusts for, he will wait for just the right moment to woo her. It won’t be long, I predict. Usually the females deposit their egg sacs in thick, winter-proof webs well before the leaves begin to fall in earnest. 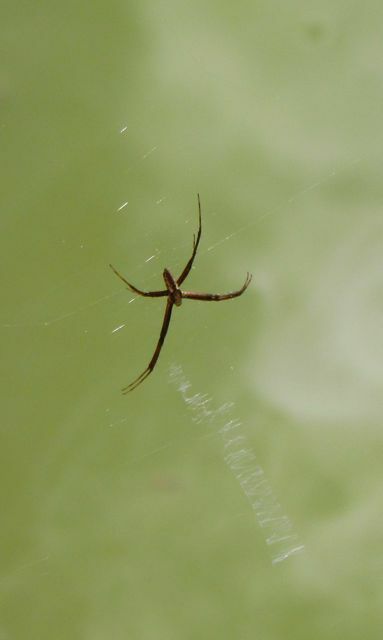 Male Writing Spider. 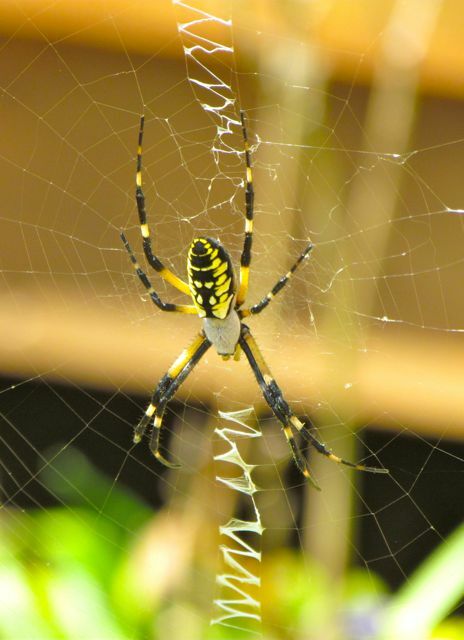 Note the smaller zigzag woven into his web. That’s mist from the water feature on the right side of the photo. Cricket songs now rule nights and mornings, replacing the steady thrum of summer cicadas. Occasional cold fronts rush in behind lines of thunderstorms, freshening our air for a day or two before summer reasserts itself, cloaked in humidity. Autumn will dominate soon enough, that we know for sure. For now, we can revel in the transitions, as plants and animals shift from growth to fruit to sleep. It’s a transitional time of year for many people too. Schools start, and birthdays occur in bunches, as those born under the sign of Virgo celebrate another dance around the sun. I send best birthday wishes to all my Virgo kin and friends, and most especially to my favorite nephew, AJR, who celebrates what many consider a milestone moment tomorrow. Happy Birthday, sir. May your journey lead you everywhere you want to go.